Flood insurance premiums just got more expensive — again. Effective April 1, the average premium rose 8 percent, from $866 per policy to $935. But the vast majority of homeowners will see increases of 5 percent or less. The increases aren’t tied to losses from any of the 2017 hurricanes, but required by two congressional fixes enacted in 2012 and 2014 that were intended to steer the debt-laden National Flood Insurance Program toward self-sufficiency. The largest increases — 25 percent — will be for subsidized policies on buildings in high-risk zones constructed before communities’ first flood insurance rate maps went into effect in the 1970s. They include non-primary residential properties, business properties, properties that sustained substantial or repetitive damages. Most properties in South Florida are in low-risk zones classified on NFIP maps as “X” zones. Premiums for these policies, which are typically $500 or less per year, increased 1 percent. 'New normal' requires year-round hurricane preparedness mindset, advocates urge. Premiums for homes built in high-risk coastal zones will increase 11 percent. Premiums for homes built in moderate-risk flood zones — typically near rivers or canals — will increase between 1 percent and 3 percent. The NFIP provides coverage for 5 million policyholders nationwide but must be reauthorized periodically. Now slated to expire at the end of July, the program is currently more than $25 billion in debt. Homes with federally backed mortgages are required to have flood insurance if they are located in any zone not classified as low-risk or “X” zone. The NFIP allows property owners to insure residential structures up to $250,000 and contents up to $100,000. Commercial structures can be insured up to $500,000 for structures and $500,000 for contents. In addition, a growing number of private-market insurers now offer flood coverage that can exceed the NFIP’s coverage limits. While some studies have estimated that more than half of Florida homeowners required to buy flood insurance aren’t buying it, insurance agents reported that images of vast tracts of residential areas inundated by Hurricane Harvey last September provoked renewed interest in flood insurance in hurricane-prone Florida. Still think you don't need flood insurance? After Harvey hit Texas, a Washington Post analysis estimated that four of every five homeowners in the eight hardest-hit Texas counties had no flood insurance. Many were in low-risk zones and not required to buy coverage, the paper said. 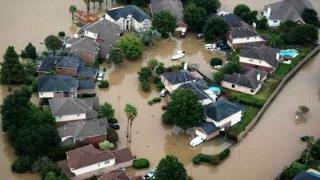 The NFIP has so far received about 91,000 claims from Texans affected by Harvey and paid out $8.26 billion — an average of $90,769, according to a spokesman for the Federal Emergency Management Agency, which oversees the flood insurance program,. In Florida, the NFIP received more than 28,000 claims after Hurricane Irma and paid about $887 million, according to a fact sheet released by FEMA in early March. Although flooding from Irma was much less severe than in Texas, payouts included about $100 million in Monroe County, $30 million in Miami-Dade County, $7.6 million in Broward County and $1 million in Palm Beach County, according to FEMA spokesman John Mills. Payouts for closed claims have averaged $48,500. In March, Roy Wright, who oversees the National Flood Insurance Program for FEMA, urged all Florida property owners to get covered. He said Floridians should look at their driver licenses, rather than flood maps, to determine whether they need flood insurance. “If it says Florida, you need flood insurance,” Wright told the Miami Herald.